...you're about to take your best tennis photos ever. 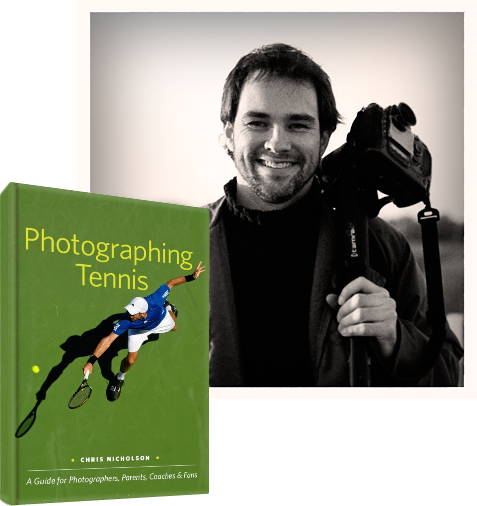 Tennis writer and photographer Chris Nicholson brings you a book detailing techniques for making great tennis photos. The pages of Photographing Tennis: A Guide for Photographers, Parents, Coaches & Fans offer a breakdown of everything the photographer needs to know before heading to court: how to choose the right gear, how to choose positions to shoot from, strategies for composing photos, techniques for timing, how to capture the ball and freeze motion, and more. Complete with 120 color photos and 15 illustrations, this instruction manual will have you quickly shooting great tennis photos. Available through Amazon, Barnes and Noble and other booksellers worldwide.